Having granite or other natural stones, such as marble, limestone, travertine, or even slate, in your bathroom, is a becoming an increasingly more popular choice. However, there is something to keep in mind when choosing to use one of these gorgeous natural stones in your bathroom, and that is humidity! As if living in Houston was not humid enough, bathrooms in this humid climate, with their warm showers and baths, might as well be saunas. The issue this proposes is that natural stone is incredibly sensitive to moisture and humidity, especially when it is not properly cared for. Whenever the heat from your hot water comes into contact with the materials in your bathroom, there can be a large impact. Even if you had all wood, instead of stone, this would still be the case. So what can you do to keep the moisture and humidity from destroying your investment and gorgeous bathroom? Having your natural stone countertops, showers, sinks, and floors sealed on a regular basis is the only way to preserve the integrity of the stone and keep you natural stone features safe from this very thick moisture. 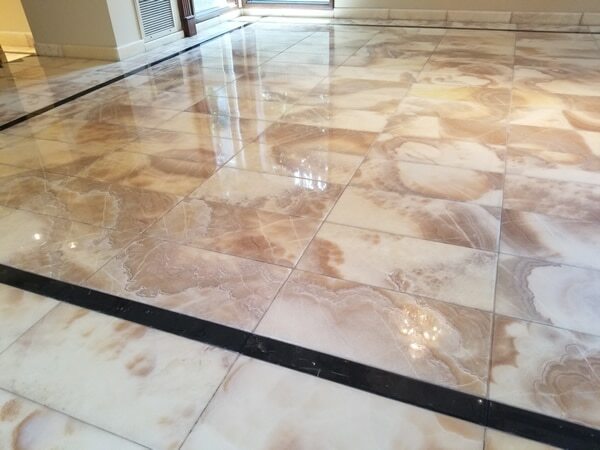 These powerful sealers we place on your natural stone will help to keep your stone from having issues with the humidity but they also serve as a barrier against superficial scratches, stains, and other unsightly damages that may impact the appearance of your natural stone. If you have, or are considering, natural stone features in your bathroom, take it seriously! This room is more humid than most outdoor environments because it is closed off in the middle of your home and does not a constant flow of fresh air coming through it. Preserve your natural stone and investment with the help of Modern Stone Care! When it comes to natural stone we are the Houston experts and cannot wait to get your natural stone in perfect condition!